Your vacation object: The Holiday apartment is located on a 2000 sqm and an enclosed garden property and water property with meadow, flowers, bushes and trees. The property is enclosed with a fence. The half-timbered house is a listed working watermill. In total there are 5 holiday apartments: BRA UCK 001, BRA UCK 002, BRA UCK 003 (3 persons each), BRA UCK 004 (2 persons), BRA UCK 005 (12 persons). The apartments are ecologically renovated with clay walls and hemp insulation, The mill room is a museum and at the same time common room for parties of up to 50 people. There is also a common room for 24 people with fireplace and TV. 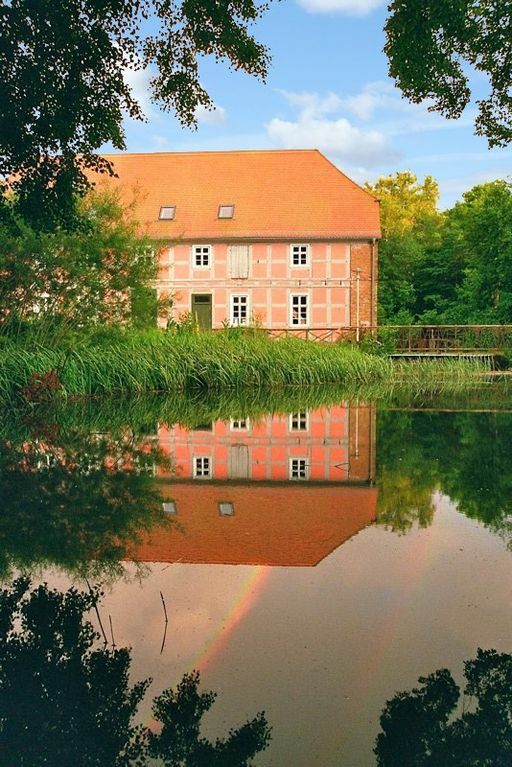 With a diameter of six meters, the water wheel is the largest in northern Germany. Mill Days with events / concerts in summer 19: 10.06., 21.06., 12.07., 09.08., 24.08. Since autumn 2015, there is a garden sauna with a bath barrel. The property is surrounded by a fence and the power. A suspension bridge takes you to the bivouac. The owner lives in a separate building on the same estate. The facilities are at your disposal for common use. Relax outdoor at the terrace or the sunbathing area with parasol, sunlounger and garden furniture. The playground with swing and sandpit makes children's hearts beat faster. For the quick cooling you can use the garden shower. Barbecue possibilities are available. The campfire place promises romantic evenings. The Note: paddle boats available in limited quantity with reservation without transport service. Please bring your own sheets and towels or order at booking. 1x hot tubs as after the sauna. 1x Sauna barrel with sea salt.
! no paddling The spa includes a sauna and a sauna. Your fitness, you can keep busy with 2 bicycles, table tennis and table tennis. bicycles you can lend at the property. Your holiday apartment: Your holiday apartment offers 1 floor, 6 rooms (from which 5 bedrooms), is 140 sqm and can accommodate up to 12 persons. On colder days your holiday apartment can be heated with central heating. Smoking is not permitted inside the rooms. The entrance is on the top floor and leads directly in the living room. The rooms are divided as follows: Living room as intersecting room and with lounge, dinette and radio. The dinette offers space for 8 persons. Bedroom with 1 double bed and dinette. Bedroom with 3 single beds and dinette. Bedroom with 2 single beds and dinette. Bedroom with 1 single bed and dinette. Bedroom with 4 single beds and dinette. Kitchen as intersecting room and with dinette, dishwasher, gas stove (5 burners), oven, exhaust hood, refrigerator (freezer), microwave, coffee machine, toaster, electric water boiler, washing machine and dryer. You have access to the terrace. Cooking nook in the living room with dinette, electric cooker (2 plates), refrigerator (freezer), microwave, coffee machine, toaster, electric water boiler, washing machine and dryer. Bathroom with shower, 1 washbasin and WC. Bathroom with shower and 1 washbasin. 2 Separate WC each with 1 washbasin and WC. In addition, your holiday apartment is equipped with, washing machine and dryer. TV or radio channel can be received per satellite. Pets: nicht erlaubt. bathroom with shower, 1 washbasin and WC. bathroom with shower and 1 washbasin. 2 separate WC each with 1 washbasin and WC. Eine ganz besondere Unterkunft auf einem superschönen Grundstück - wir haben uns sehr wohlgefühlt. 100% empfehlenswert!